Just one step and you're in the magical labyrinth of Rome and only 300 m from the Vatican Museum. 150 m. from 'Ottaviano - San Pietro, metro station. A recently renovated antique building on the 2d floor, perfect for young and dynamic people who want to enjoy the city. All the rooms are well equipped with comforts necessary for a pleasant stay.Air Conditional is included in the price. - If you need to arrive after this time please call us and leave your mobile number if you have!! - Pick up service from/to the airport available. euro 50/60 for 1 car, If you need it, please send an email and leave your flight details. Ring at the bell number 14when you arrive! check in after 23:00 euro 10! Language: english, italiano, espanol, francais, magyar. PLEASE SEND AN E-MAIL FOR TO INFORM YOUR EXACT ARRIVAL TIME AT THE B&B AND IF YOU HAVE A MOBILE NUMBER, LEAVE US THE NUMBER!! Call the phone number that you receive in the confirmation email after your booking. When you’re planning your trip to Rome please include this beautiful place in your stay. It is clean, in a great location and Freddy is very helpful! From the heart of Rome to host Freddy, One Step from St Peter's is truly an experience of home away from home: "That's Amoré!" Snacks a plenty; lovely common areas; spotless shower; peacefulness coming & going to Metro w/in walking; minutes away from food, restaurants & sites, including St Peter's: "That's Amore!" Here in 2007, here now...here's hoping to return soon: "That's Amore!" 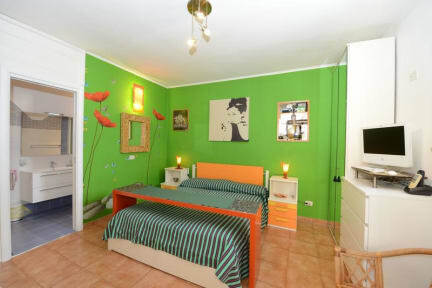 Great location, really close to Vatican and near metro station, very clean and comfortable. Manager Freddy was really helpful and friendly. Also everything you need to have a good and fast breakfast (croissants, biscuits, cookies, coffee). Highly recommended. What a find! I will be back. Had a great stay here. Very homey vibe. Lots of character. Very clean and functional. Quiet place to work from during the day if you need to. Freddy is very friendly and flexible with any needs you have. I had the small single room but it had a great vibe and lovely window view. Really excellent place. Freddy is a really personable host with excellent English. Communication was never an issue. The hostel was a little bit hard to find, but it’s very close to the Vatican and several bus stops as well as the subway. It‘s very nice inside and the bathrooms are excellent. I was actually the only one staying there as the apartment had just been renovated, and I loved it! Great location, very clean and safe, and I even got the balcony room! Very friendly manager. Thank you, Freddy, for a great stay! I would happily come back again. We had a great time staying here. The hostel was about a 15 minute walk from the Vatican and St. Peter's Basilica, and there's a Metro Station only a few minutes down the road, so it was very convenient to get around. Freddy was very accommodating and made us feel at home immediately. The place was very clean and our room was spacious and had air-conditioning. I would highly recommend! Great hostel if you want your own space and to be near to either coworking spaces or Vatican City. Also very near transportation. After party hostel to party hostel, this was a great reprieve to get back into sleeping 8 hours a night. Would definitely recommend! This hostel has been a wonderful place to live. It's super close the Vatican, the staff and owners are incredibly friendly and down to earth and surrounding area is friendly and easy to navigate in. 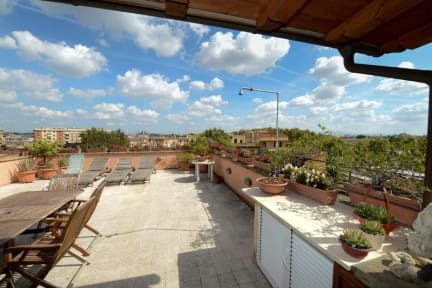 The fact that the hostel is so close to the Vatican means you are very close to Rome's city center and can, whether walking or by train, easily get to any tourist site or location you desire.